The village of Govedartsi is situated just 80 kilometers from Sofia, at the foot of the Rila Mountain, near Cherni Iskar River. It is a national mountain resort. Visitors can have a walk in Maliovitsa valley, climb Maliovitsa peak and enjoy beautiful sights. The village of Govedartsi is a starting point for routes to the magnificent Rila Monastery and the seven Rila lakes. Near the village is situated Iovchevo Lake, where you can make a picnic. 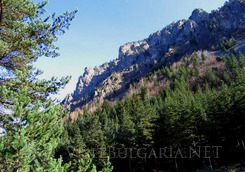 In Govedartsi region you can also have a walk in a beautiful pine forest, pick up forest fruits, mushrooms and herbs. There are excellent conditions for ski during the winter. There are regular bus lines to the town of Samokov, where you can visit the town’s museums. Govedartsi is a preferable place during the winter season because of the proximity to the Bulgarian oldest and biggest winter resort Borovets (just 26 kilometers). So you can use the big and settled racing tracks of Borovets and after the active sport activity, enjoy the complete calmness of the village. The keen ski runners could spend the day skiing in the resort and in the evening peacefully rest in the little village. In the vicinity of the village Yonchevo lake is situated. One could have a picnic there or have a walk through the beautiful pine-woods, in search for wild fruits, herbs or mushrooms. Only at the distance of two kilometers to the southwest is located the tourist base of the village. The base is a complex of electrified and water – supplied bungalows. During the winter, perfect skiing conditions – drags, and ski rental outfit – equipment are offered to tourists. Lots of tourists come in Govedartsi using the bus line from Samokov to Malyovitsa, which passes through the village.